Start with the crust, then make the filling that holds the strawberries. Gather your additional toppings just before serving. Combine sugar, flour, and salt in a bowl and mix; then chill for 1/2 hour. Blend flour mixture in a food processor with shortening and butter until butter forms pea-sized shapes. Add cold water and blend some more. Place dough on a floured surface, wrap it in plastic wrap, and chill for at least 1/2 hour. Roll dough and cut into circular shapes to fit inside four 4-1/2 inch tart pans. Gently press into the pans. Cut off excess dough from the edges. Cover each piece of dough in the pan with buttered aluminum foil (buttered side down). Place dry rice on top of the foil, and bake for 10 minutes at 375 degrees Fahrenheit. Remove the rice and foil from tart crusts, prick the bottoms with a fork, and bake at 375 degrees for another 15 minutes or until lightly browned. Cool tart crusts while you prepare the filling. Beat egg yolks and sugar for about 4 minutes (until thick) with an electric mixer on medium-high speed. Add cornstarch and beat mixture on low speed. Add hot milk to egg mixture and continue beating on low speed. Transfer mixture to a saucepan over low heat, and whisk constantly for about 7 to 9 minutes, until the mixture thickens into a pudding-like texture. Stir in butter, cream, and vanilla. Pour custard mixture into a bowl, cover with plastic wrap, and chill it in the refrigerator. 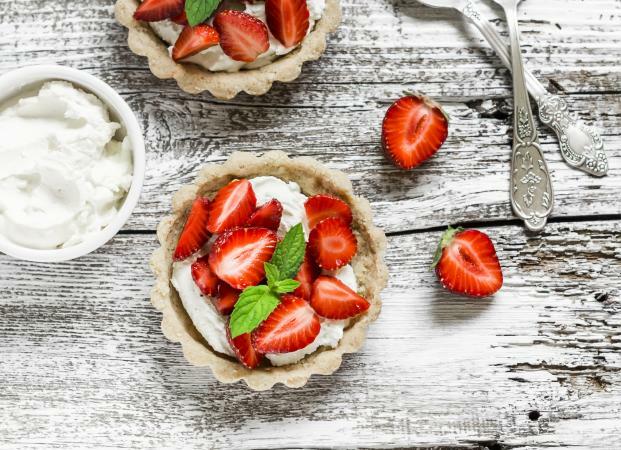 Place custard into tart crusts, top with strawberries, and serve!